Basseterre, St. Kitts (September 22, 2017) — Peace-loving citizens and residents of the Federation of St. Kitts and Nevis this month had more than one reason to worry about their lives and property as well. But as they would have it, even as danger lurked, the period was one of calmness brought about by the dynamic and caring leadership of their Prime Minister Dr the Hon Timothy Harris. In a short period of less than three weeks in the month of September, the twin-island Federation faced the wrath of three most dangerous hurricanes – Irma, Jose, and Maria – in quick succession with two of them inflicting considerable damage to the country’s infrastructure and property. However, leading from the front was Prime Minister Harris who undertook to manage the crises by not only comforting his people by word, but by action when he was out and about in early hours of the morning after two of the hurricanes would have passed. He cares; he is practical and has proven that he is not an armchair leader. Before the passage of Hurricane Irma, he was the last person up assuring and advising the general public through live broadcasts on national radio and television on how to go about protecting themselves during the passage of the storm. Even before the last strong winds from Hurricane Irma had left us, he was out not inspecting emergency crews at work restoring fallen power lines and clearing the roads but actually assisting them in doing the jobs. He also visited and calmed families that would have suffered damage and guided them on how they would get state assistance. The moment when the country needed strong leadership that it could trust and rely on, it received stable, calm and an all-encompassing leadership. There was no panic at any moment in time either before or after the passage of Hurricane Irma. Thankfully the country was spared the wrath of Hurricane Jose. Hurricane Maria was forecast to affect the Federation of St. Kitts and Nevis on Tuesday September 19, our Independence Day when we were to celebrate our nation’s 34th anniversary of independence. At a Cabinet meeting chaired by the Prime Minister on Monday September 18, it was agreed that all Independence Day activities would have to be put off. But the most telling one about Prime Minister Harris’ love for his country and people was when the general public later learned that he had taken the decision to forego his attendance at the United Nations General Assembly that was taking place in New York. He did that so as to be in the Federation to take charge of any emergencies that would arise as a result of the passage of Hurricane Maria. And he did all that. After consultations with members of his Cabinet, the Nevis Island Assembly, and members of the social and economic sectors Prime Minister Harris advised our Governor General His Excellency Sir S.W. Tapley Seaton, GCMG, CVO, QC, JP, to declare Wednesday September 20 as a National Clean-up Day. Response to the National Clean-up was overwhelming. Prime Minister Harris visited a number of places including Frigate Bay, but it was on the Bay Road by the Basseterre Public Market that persons remarked loudly that they had never witnessed such a quick response to a disaster, and with their leader participating and engaging those working. The Old Road Bay where he visited on Wednesday shortly after 11:00 amsaw Public Works Department workers under Civil Engineer Mr Kevin Williams rejuvenated. The result of Prime Minister Harris’ leadership in that particular area is nothing short of being miraculous. The Old Road Bay opened for vehicular traffic at 6:00 am on Friday contrary to fears that it would have taken more than a week to have it opened. We are dealing with a Prime Minister who is well connected to his people and who reads public sentiments well. 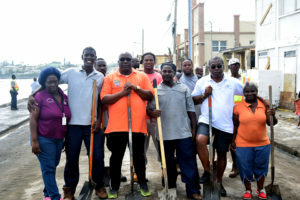 He leads from the front, leading by example with engagement with the people at all levels as his activities in the post-hurricane clean-up clearly demonstrated. Leadership for times like these: not every country is blessed enough to have it. There was no hesitancy in our Prime Minister’s response and there was clarity in the communication and consistency in the communication which basically is unheralded in times of crises. The Federation is blessed to have a leader in Dr the Hon Timothy Harris, who is also the Minister of National Security. What the Federation of St. Kitts and Nevis has seen and experienced from its leader in the short period since the arrival of Hurricane Irma followed by Maria, is that Dr Harris is a remarkable leader who puts his country and his people first. It is leadership that really matters. 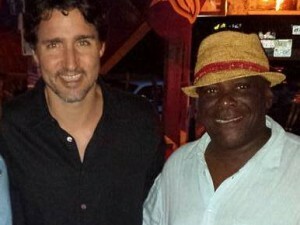 Prime Minister Harris truly lives to the motto, Country Above Self.